Today we feature Martin Chard from Marxman. He was recently featured on Dragons’ Den where he introduced his marking tool to a wider audience. 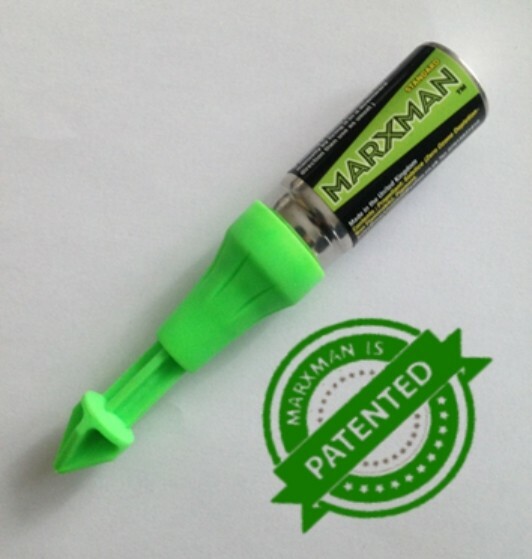 We are a small start up business, manufacturing and selling the Marxman pen which I began developing in 2010 to solve the common problem tradesmen and DIYers face of being unable to clearly mark a drilling position – either due to the type of wall surface or because they are at a distance from the wall. I’m 50 years old and have been a self-employed building maintenance man for the last 30 years. I’m married to my wife Jenny and we have four grown-up children, two labradors and a rabbit! I came up with the idea for Marxman after trying to fit a sink. I couldn’t mark the drilling position on the wall and see the marks so after a few, time wasting attempts, I reached for a can of black spray paint in desperation and marked it with that. After too many frustrating incidents like this and lots of wasted trips up and down ladders with broken pencils and felt tips not doing the job, I started the process of developing Marxman so other workers could benefit. I use my inventor’s head with problem solver on the side mixed with a lot of energy and enthusiasm. I recommend they do their research into the market for their product, gain knowledge from reputable sources on which way to go in terms of patents, suppliers etc and don’t give up easily. Dragons’ Den was a surreal, fun, exciting and nerve racking experience which, for us, was a great success. We would advise anyone thinking of applying to really get to grips with their business and ensure their figures are in order. If they are unsuccessful at least they will come out with better knowledge of their business. I did not read any books on the subject but there is a world of knowledge and experiences shared on the internet. My plan is to continue to promote Marxman here in the UK before looking to branch out to other countries. We love walking the dogs and spending time with our children, family and friends. The name Marxman was thought of by our son Oren when he was 15. Not only does it reflect the fact that the pen helps you precisely mark your drilling position but, knowing I am dyslexic, he played on the spelling of marksman which really appealed to me – x marks the spot. The colour Marxman sprays is not only fluorescent but also glows in the dark so we admit we have used it occasionally on the family to make them glow in the dark! I have certainly made lots of decisions in this process, I could not pinpoint the best but deciding to go for the Patent was the biggest. Standing in the car park of DH industries having just filled my very first Marxman. To learn more about this nifty tool please visit Marxmanpen.co.uk.